One of the most difficult traumatic injuries to diagnose and treat is the horizontal root fracture. I think it’s pretty confusing, if you ask me. Many times with a horizontal root fracture, the treatment is actually to do NOTHING. I usually give a horizontal root fracture time to heal on its own and let the body do its thing — as long as the tooth is stable and not mobile. If the tooth is mobile, and depending on the level of the fracture, you may need to stabilize it for some time with a flexible splint. 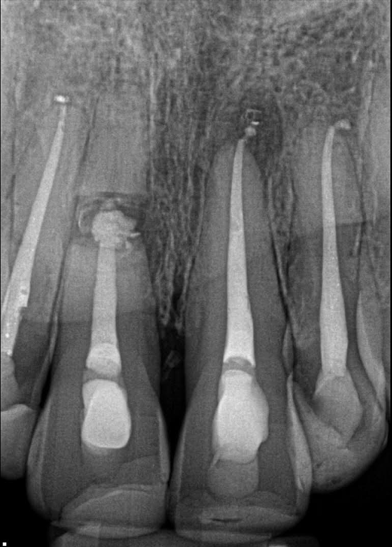 Apical fractures have the best prognosis, and then midroot, and then coronal. Why? Well, the apical fractures will be more surrounded by bone and therefore less mobile. And since the fracture will also be far away from any bacterial contamination this also increases the prognosis. As the fracture moves up the root, the prognosis decreases. 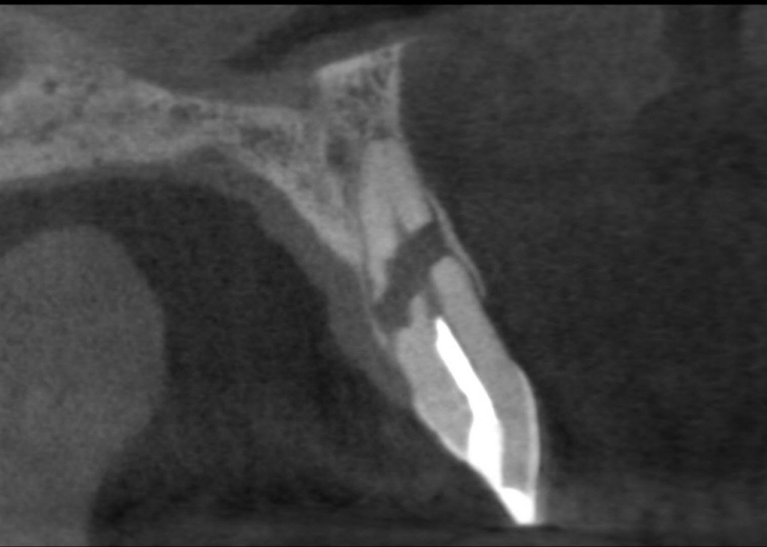 So, the more coronal the fracture, the more mobile the fragment and the more chance of bacterial contamination. 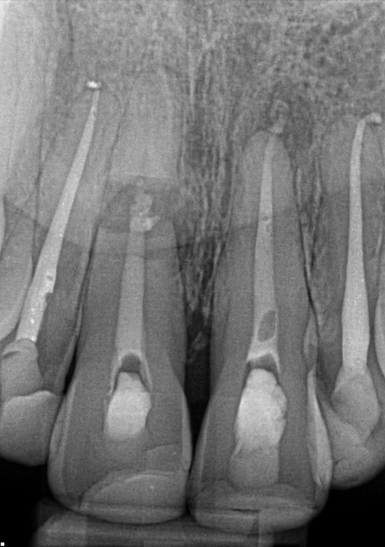 If a tooth with a horizontal root fracture becomes symptomatic and you cannot delay treatment, usually you only have to treat the coronal fragment because the apical fragment remains vital. Take a look at this case that serves this perfect example. Once again the cardinal rules of root canal therapy were violated in teeth #8 and 9 — the canals were located and treated, but they were not instrumented to working length or working circumference. So, I diagnosed her with Previously Treated #8 and 9 with Asymptomatic Apical Periodontitis #8 and 9. 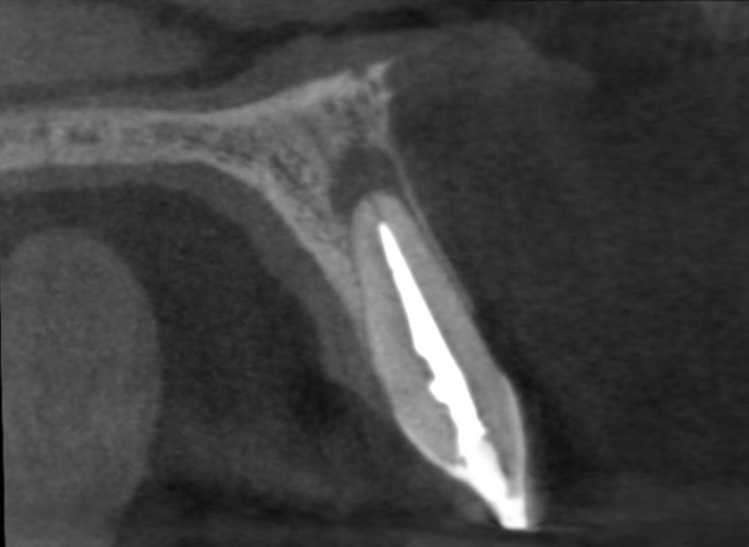 You can see that the coronal fragment of #8 has a periapical radiolucency, but the apical fragment does not. You can also see that #9 has a periapical radiolucency. 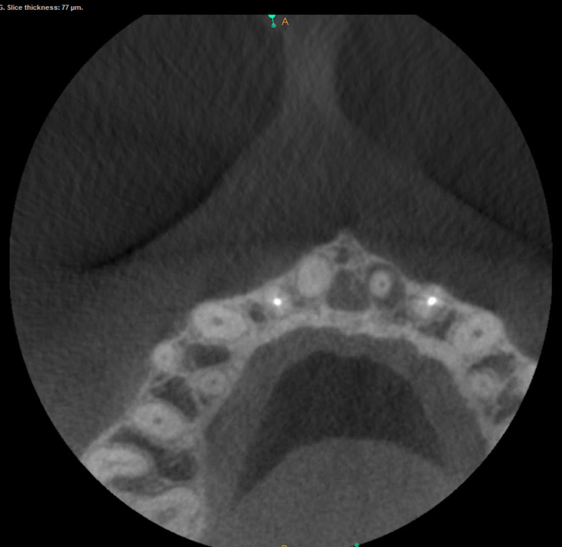 I took a CBCT to get a deeper look and this is what I found. You can see clearly that the working length has not been achieved on either view. And the fracture on #8 is significant. Believe it or not, that tooth had and continues to have no mobility. The axial view of #8 was a bit shocking and showed me that I was not going to be able to contain my obturation material…. So based on this image, I knew that I would have to obturate #8 with MTA since I needed something that was compatible with the bone because extrusion was likely. So, my treatment plan was to retreat the coronal fragment #8 and retreat #9. 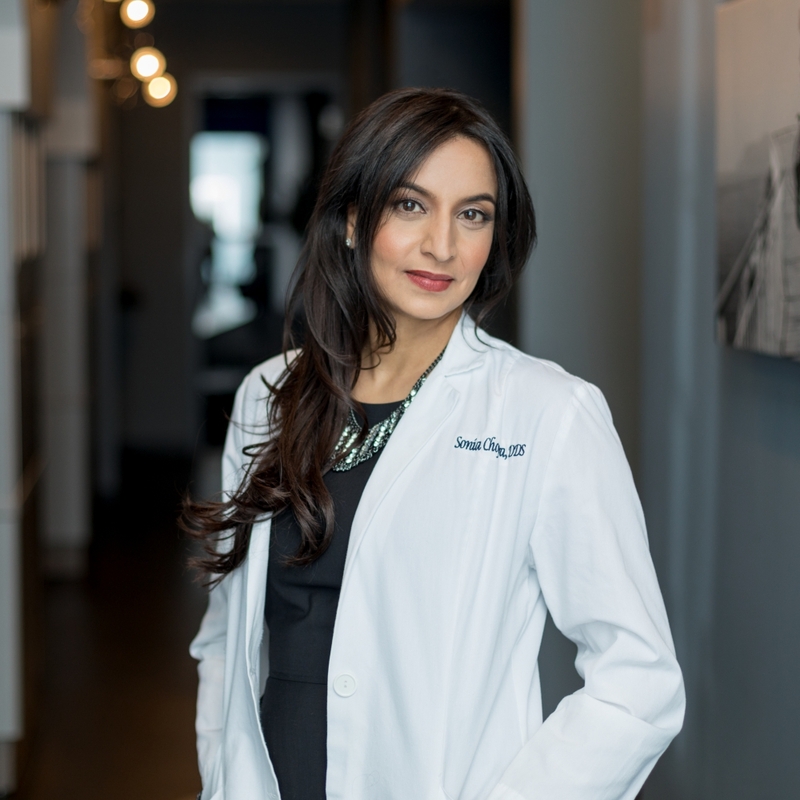 I also told her that if there was no healing around #8, that there is a small chance that I would have to remove the apical fragment surgically in order to have access to the apex of the coronal segment in order to retroprep that area. 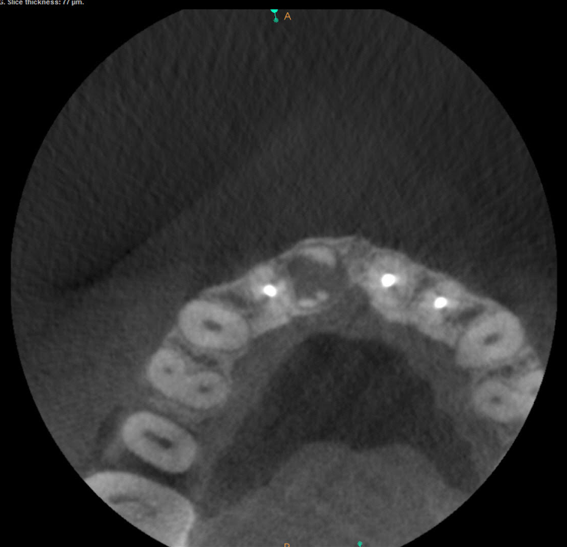 Apically, the CBCT confirmed that the apical segment of #8 was fine and that there was a periapical radiolucency on #9. 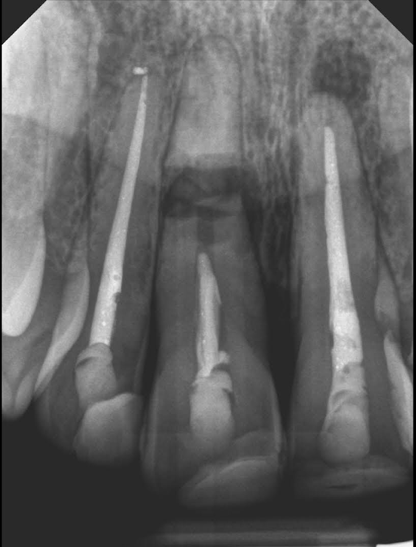 I then obturated with MTA in tooth #8 and gutta percha in tooth #9. 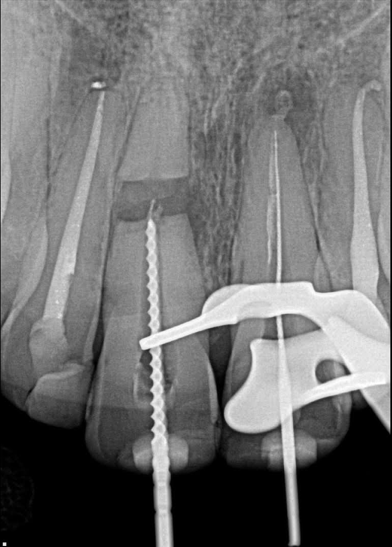 As expected, the MTA fill appears out of the root, but since MTA is osteoinductive and osteogenic, I was happy with it. Since follow up is key with these patients, I brought her back at 6 months…. You can see that the periapical radiolucencies are getting smaller and she is completely asymptomatic. Remember, don’t expect lesions of this size to ever disappear overnight. Bone is slow and lesions like these take lots of time to regenerate back in with bone. I plan on seeing this patient again in another 6 months to see how she continues to improve. So, tell me how would you treatment plan this case — would you try to save the teeth? Well, I hope so and I hope my blogs continue to give you insight on how to save TONS of teeth! 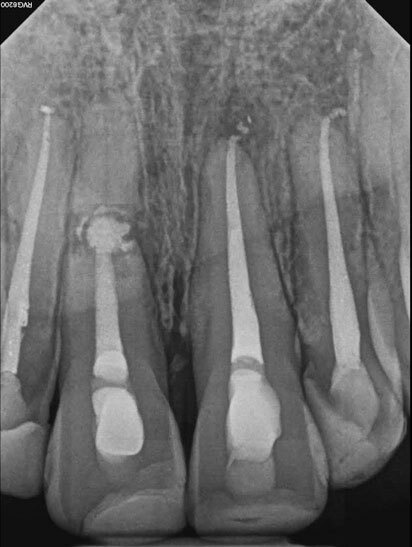 Horizontal root fractures usually do not need to be treated, but when they do try to treat only the coronal fragment. Don’t forget to give your bone time to heal and follow up your patients. I plan on watching this lady for the next few years to make sure she gets her bone back. I am wondering how you place the calcium hydroxide to medicate the teeth????? Hey there!! I use a Vista tip that is flexible that I can place pretty far into the canal. Then I gently express the calcium hydroxide into the canal. I like to use Ultracal from Ultradent. I mention this in my top 10 tools blog where you can see the images and get the link. I would have thought for sure to extract the tooth. Thanks for going through this case, very informative. What a great case! I always look forward to learning from your blogs. And I appreciate you reading!